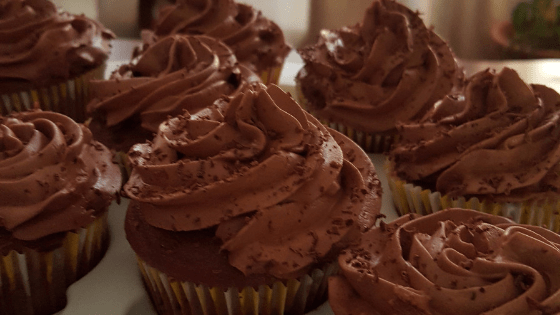 I’m a chocolate lover and this Decadent, Dark, and Delicious Chocolate Cupcake recipe is one of my favorites to make. They’re moist and light and at the same time that have a flavorful rich chocolate taste. Preheat oven to 375 degrees. Line cupcake pans with 24 liners and set aside. Using small bowl mix boiling water and cocoa powder until smooth. Let cool to room temperature. Using another bowl whisk together baking powder, flour, and salt. Using electric mixer beat butter and sugar together until light and fluffy. Add eggs one at a time, stirring after each addition. Beat until smooth. Beat in vanilla extract and then add in flour mixture a little at a time until blended. Add room temperature cocoa mixture and stir until smooth. Lastly, add in 8 oz of sour cream and blend until smooth. It will become fluffy. Fill each cupcake liner until about 2/3 full and bake for 16-18 minutes. Check progress with toothpick. Oven times will vary especially when adding sour cream to the mix. Toothpick should come out clean. To avoid dry cupcakes, don’t over bake. Place cupcake pans to wire rack. Once cooled, remove from pan. Using double boiler or small saucepan melt chocolate. Let cool to room temperature. Using your electric mixer beat room temperature butter until smooth and creamy. (If you use butter that is not room temperature it will result in chunks and not smooth.) Add confectioner’s sugar a little at a time until all is added. Mix in vanilla extract. Beat on high until frosting is smooth. Using piping bag decorate cupcakes and sprinkle garnish on top. Tell me, do these look delicious?